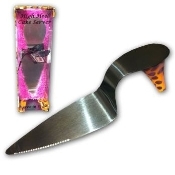 Find all our serving utensils from fun animal print high heel cake servers to traditional cheese spreaders. 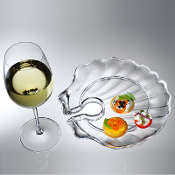 Acrylic Wine 'N Dine Party Plates, Set of Four // With their striking seashell deign, these generous size plates are ideal for all indoor and outdoor entertaining. The crystal clear acrylic plates will allow... Hand-crafted by skilled artisans, this ice bucket is elegant and functional. 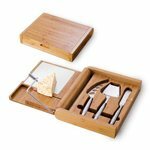 Picnic Plus Bamboo cheese tool set and holder These Colored Ganz Grape Wine Bottle Measuring Spoons have a leather like loop to hold all spoons together. This 4 piece set includes 1 Tablespoon, 1 Teaspoon, ½ Teaspoon, and ¼ Teaspoon. This beautiful Décor copper pitcher serves water, to be sure, but it also makes a great flower vase. Large 2¼ Qt capacity means less refilling, handy guard keeps ice in the pitcher where it belongs. 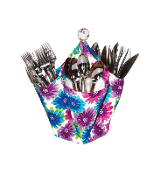 Our unique Decka utensil caddy from Picnic Plus holds forks, knives, spoons and napkins for your indoor or outdoor party. These Ganz Grape Wine Bottle Measuring Spoons have a leather like loop to hold all spoons together. This 4 piece set includes 1 Tablespoon, 1 Teaspoon, ½ Teaspoon, and ¼ Teaspoon. Bring some fun into the kitchen with this beautifully detailed set of Ganz measuring spoons. This is the perfect gift for almost any cook, bride, birthday or house warming. Set of 4 grape spreaders. You will be ready for barbeque season with these stainless steel Barbeque Skewers. These BBQ Skewers are flat in design which will keep your food in place and prevents the food from spinning. This stylish animal Leopard Print High Heel Cake Server is made of durable stainless steel with a serrated edge for slicing. Give the perfect gift that has everything you want in practicality and style. This stylish animal zebra print High Heel Cake Server is made of durable stainless steel with a serrated edge for slicing. Give the perfect gift that has everything you want in practicality and style.